It’s amazing how spices can really make an impact on a meal. 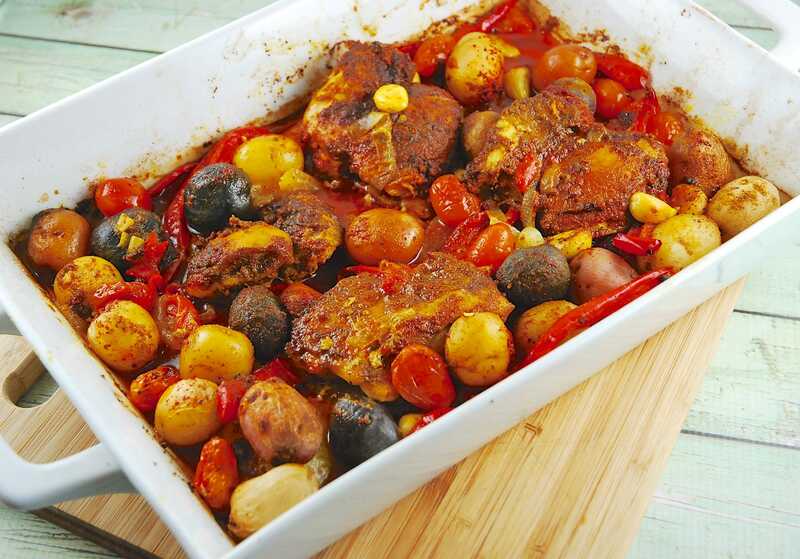 Take this Roasted Middle Eastern Chicken with Potatoes Recipe, for example. It’s really just a simple dish of chicken and potatoes, but the blend of Middle Eastern spice combination, turns this basic recipe into something absolutely mouthwatering. To keep this dish light, I calculated the nutritional stats based on only using chicken breasts. But if you want to spend an extra Point or two, use a variety of chicken cuts – thighs, drumsticks…whatever you’d like. The potatoes pick up all the flavors of the spices and the juice from the chicken, so they are heavenly. And the tomatoes help add a touch of acidity to bring everything together. This is a SUPER easy Weight Watchers Chicken recipe with minimum prep, and my family absolutely loves it. Enjoy! Tender chicken and vegetables roasted to perfection with a wonderful Middle Eastern spice blend. It’s quick and easy to prepare, but makes quite an impression. This delicious Weight Watchers chicken recipe is healthy, light, and full of flavor! Preheat oven to 400 degrees and spray a baking dish with cooking spray. Place onions in bottom of baking dish. Combine turmeric, cumin, paprika, coriander and salt & pepper in a small bowl. Place chicken on top of the onions. Scatter potatoes, tomatoes and garlic cloves throughout. Drizzle everything with olive oil, ad then run the seasoning mix all over the chicken, making sure to coat all sides of the chicken. Sprinkle some seasoning mix over the vegetables as well. Cover with foil and place in the oven for about 30 minutes, or until chicken is cooked through and potatoes are tender. Remove foil and place back in oven for another 5 minutes to brown the top. For the 5 minutes, should it be on the BROIL setting or continue on the bake at 400F? How many carbs in this recipe? Oh geez! I can’t believe I left that out! There are 14g carbohydrates. Thanks for catching that. Has anyone tried this in a slow cooker? Or pressure cooker? What were your results? This was delicious. I agree with the other comments; it took about 45mins then the 5 uncovered. The leftovers were great for a chicken salad (just added mayo, celery, and lemon juice). Delish! Thank you for the recipe. We just made this as a part of our Sunday meal prep. I found the flavors to be delcious, but I agree with other reviewers it took approx. 45 minutes to cook. The only criticism is it was a bit dry (the spices became chalky) so if I was to repeat I’d add a bit of broth (so I don’t add more fat). Thanks much for this great recipe! We thoroughly enjoyed it tonight! I only had chicken thighs so i browned them up before putting the roasting pan together. I had bulked it up with some asparagus and mushrooms I had in the fridge. Loved the spices! I was so excited to smell those divine smells wafting thru my house, bringing my back to my roots! I made this tonight and I found that it needed 45 minutes in the oven before you take the foil off, then 5 uncovered. That being said, this dish will absolutely become a staple here. We loved it! I served it with roasted carrots (with more roasted garlic cloves) and chunks of baguette. Thanks so much for this recipe! I love your blog! After 30 minutes nothing was even close to done! And did you mean coriander seeds? Wondering since cumin is ground coriander. Sticking everything back in and hoping that it gets cooked soon. I am hungry! Cumin is cumin and coriander is coriander (cilantro), they are two different spices. I made this last night for dinner and we loved it. It also has everything I look for in a weeknight dinner- tasty, easy and everything in one pot. I made a couple of changes-I used thighs since I had those on hand and we prefer them to breasts so I cooked them a little longer. I also added a few chili flakes since we like things a little spicy. But from walking into kitchen to plating in about an hour. Ready to dish up when my wife walked through the door. (I get extra points for that kind of timing!). Next time I may up the tumeric since I don’t use that very often and really enjoyed the flavor. Put it in the oven, jumped in the shower and opened a nice bottle of wine. This recipe even caused me to create a new Pinterest board: Regular dinner roatation! Thanks for this. We will enjoy it MANY times. There’s a restaurant here in my town (Byblo’s) that serves something just like this that I love, but have always been afraid it was just much too high in calories. I will be making this for sure; thanks so very much!